Place ingredients into labeled freezer bag and freeze overnight. When ready to serve simply add 1 Cup coconut water, almond milk or milk and 1 tub Symbio Blueberry Wholegrain yoghurt to a blender and blitz. Place ingredients into labeled freezer bag and freeze overnight. When ready to serve simply add 1 Cup coconut water, almond milk or milk and 1 tub Symbio Apricot & Mango yoghurt to a blender and blitz. 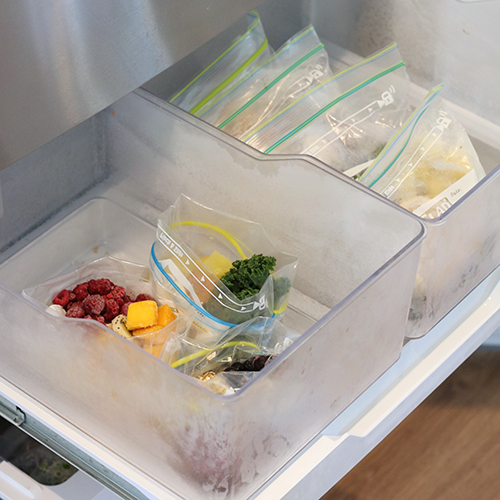 Place ingredients into labeled freezer bag and freeze overnight. When ready to serve simply add 1 Cup coconut water, almond milk or milk and 1 tub Symbio Vanilla Bean yoghurt to a blender and blitz. If you find yourself feeling that there’s never enough hours in the day then the good news is you’re not alone. Sixty-two-percent of women who took part in a recent Women’s Wellbeing Survey say they struggle to get everything they need to get done in a single day. To make matters worse a staggering 74 percent of women surveyed said these time pressures make it especially hard to maintain a healthy lifestyle. I fall smack-bang in the middle of these stats and that’s probably why my healthy eating is the first thing to go when time gets tight. So to try and get my eating back on track I’ve decided to make some small changes that I’m sure will have big benefits. For starters I’ve just made a big batch of my favourite Frozen Smoothie Packs and wanted to share them with you today. These packs are great because they’re single portion serves so when you’re in a hurry you just grab one out of the freezer, add a tub of Symbio Probalance Yoghurt and milk, almond milk or coconut water, blitz in a blender and voila! They’re also great for using up any left over salad greens and fruit and are perfect for adding extra goodies like LSA, seeds, nuts and even protein powder if you feel you need an extra boost. Gather all of your ingredients. 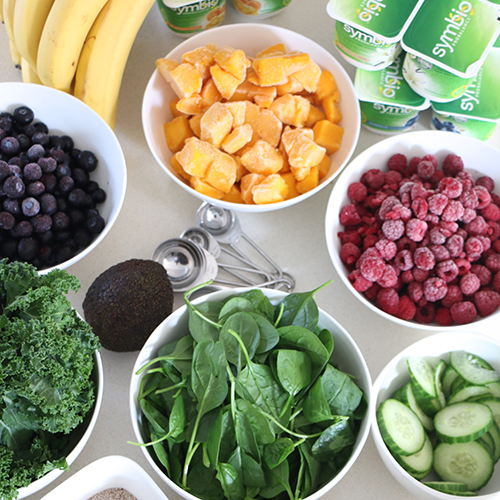 These Frozen Smoothie Packs are perfect for using up all of your left over greens and fruit. Place all of the ingredients into individual freezer bags and clearly label with a Sharpie so you know what’s inside each bag. Freeze! 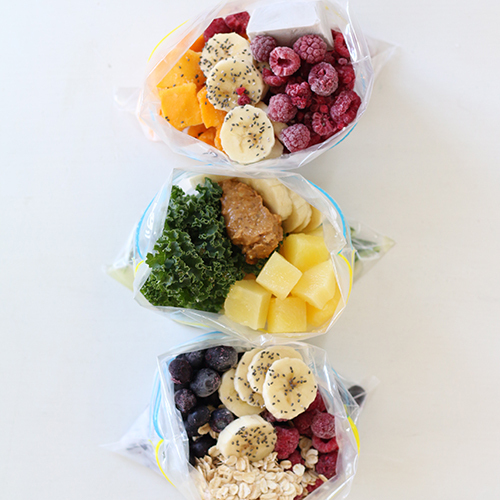 The Frozen Smoothie Packs will last in your freezer for up to a month making them super convenient. 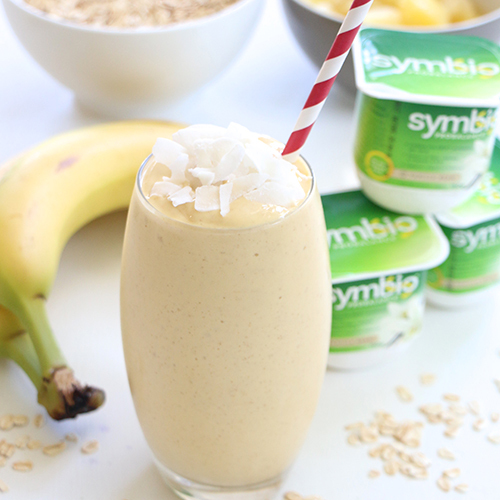 When you feel like a healthy smoothie simply grab your desired flavour out of the freezer, pop it in a blender, add a pot of your favourite Symbio yoghurt and your preferred liquid, blend and enjoy! Leonie Barlow knows only too well how hard it can be to juggle family and career. The 49-year-old mother of two young sons and owner of popular Kiwi lifestyle blog The Style Insider says eating well is key to surviving a fast-paced lifestyle.